Home » Columns » A Strange Coincidence! 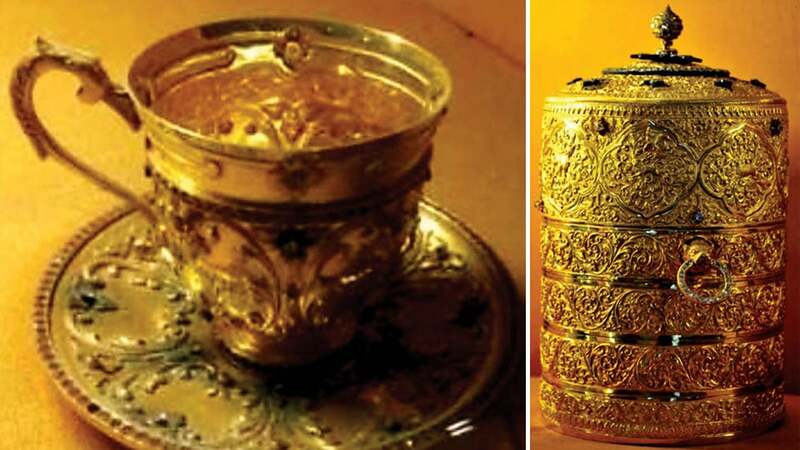 A priceless, richly ornamented, solid gold Tiffin Carrier along with its accompanying cup, saucer and spoon, all of them inlaid with precious stones like rubies and diamonds, were reportedly stolen on the night of last Sunday from the Nizam’s Museum at Hyderabad. Their total weight is about two kilograms and their present value in the antiques market is estimated to be a whopping fifty crore rupees! It was a strange coincidence that my wife and I happened to visit this museum on Sunday morning, barely a few hours before the heist took place. We were in Hyderabad for three days as I was participating in the annual conference of the Diabetic Foot Society of India which was being held at the Park Hyatt Hotel there. Since this not-so-well-known museum did not have any other visitors when we were there, despite it being a Sunday, we were perhaps the last few people to have seen these precious artefacts and will remain so unless they are recovered intact and are once again put back on public display! There is every possibility of them being quickly melted down for their bare gold value if the theft happens to be the handiwork of a petty thief. And if an international cartel of art thieves happens to be behind it, there is the likelihood of these objects being carted away across our shores to land clandestinely and at great profit, into the hands of some private collectors who have no qualms about buying stolen stuff to quench their vanity. The possibility of them turning up in some international auction houses like Sotheby’s or Christie’s is very unlikely as firms like these do not accept and put up for sale articles that are clearly known to have been stolen. Although it has happened quite often in the past, they do not do it any longer! The Nizam’s Museum is managed and maintained by a private trust established by the Nizam’s family members and it was inaugurated in the year 2000 by the then Chief Minister Chandrababu Naidu in the presence of the seventh Nizam’s eldest daughter-in-law Princess Durru Shehwar and grandson Prince Muffakham Jah. This museum was established to mark the silver jubilee of the coronation of Mir Osman Ali Khan, the seventh Nizam of Hyderabad, who passed away in February 1967. He was the last official Nizam who stepped down from his post of ruler when the Royal State of Hyderabad was merged with the Indian Union on 17th September, 1948. It is a different matter that the Nizam’s family has privately anointed and installed Mir Osman Ali Khan’s eldest grandson Mir Barkat Ali Khan, also known as Mukarram Jah who now lives in Australia, as the eighth Nizam in a personal bid to perpetuate their once royal lineage. This is very much like how we have here, the tradition of the private coronation of members of the Wadiyar dynasty, by their family members to maintain the continuation of their royal lineage! The Nizam’s museum depicts a pictorial history of the Asaf Jahi Dynasty, which ruled the erstwhile State of Hyderabad for over two centuries ever since the first Nizam took over as the de facto ruler soon after the death of Emperor Aurangzeb in the year 1707. Very surprisingly, it is housed in a very rickety more than two century old colonial style structure acquired from its former owner Ruknudaulah by the second Nizam Asaf Jah II and later renovated as a residence for his then young heir apparent. Most visitors to Hyderabad give it a go by in favour of the more famous Salar Jung and Chowmahalla Palace Museums, but this too is certainly worth a visit if you are interested not just in collected memorabilia but in history too. READ ALSO My brush with the Ten Commandments! Interestingly, one of its wings houses the largest walk-in wardrobe in the world! It is made of Burma Teak and is a full 238 feet long with dressing cubicles between every two shelves with a second story of shelves that were meant for the Nizam’s footwear! Its owner Fateh Jung Mahbub Ali Khan, the sixth Nizam was known for his love for clothes and was rumoured to have never worn the same dress or the same shoes twice! This museum has some gold and silver objects on display whose material value itself is very high not taking into account their historical worth. These include gold and silver replicas of almost every public building, bridge and dam that now stands on what was once the Nizam’s domain. Also included are the solid gold trowels, mortar bowls and scissors that the Nizams used to lay their foundation stones or inaugurate them when completed. As my wife and I walked out of the rather ramshackle and almost crumbling more than two century old building, we remarked to each other that objects like these should have been housed amid much greater safety and security where they can be better protected. That was also when I said, as we got into the car, that if someone decided to steal them, it would be a very simple job to just break in through a ventilator and walk away with all the precious objects which had been displayed in ordinary glass showcases without any kind of a protective barrier. And, that is exactly what happened just a few hours later as we reached our home late that night and sat chatting with our children about the Nizam’s magnificent gold tiffin carrier that we had seen at the Museum! Nizam and Pakistan, that says all!